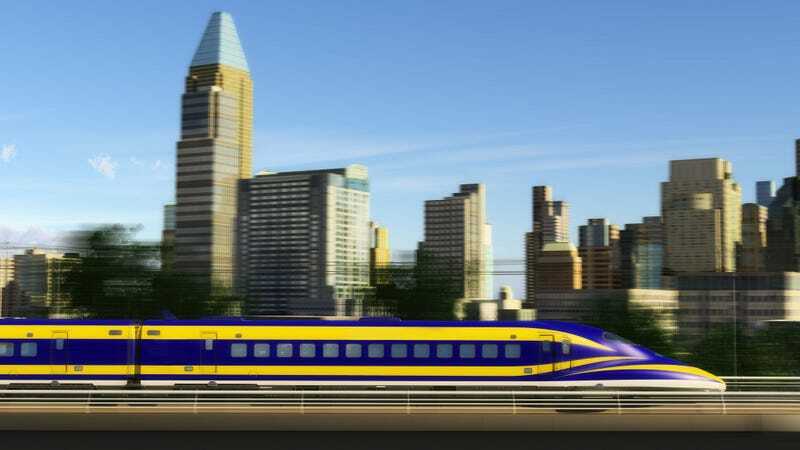 California’s high-speed train has just been delayed by three more years. The first leg of the state’s high-speed rail is now set to finish by 2025, not 2022 as planned. This could mean that Hyperloop—the Golden State’s other, even more futuristic transit plan—could beat the bullet train to the station. That first leg of California’s bullet train has already been fraught with problems. Last month, it was announced that the first leg’s location was completely switching locations from LA to San Francisco, in hopes to get the project out on time. Southern California’s complex mountain ranges require 36 miles’ worth of tunneling, an expensive and time-consuming task which could’ve slowed the project down even more. Apparently, despite the move, the project is still projected to be running late, the Los Angeles Times reports today. California’s $64 billion bullet train started construction last year and is currently America’s most realistic attempt to finally build high-speed rail. It’s planned to zoom 220 miles-per-hour between San Francisco and Los Angeles. The Hyperloop, meanwhile, may travel roughly same route. But instead of classic rail, it will be Futurama-like tubes that’ll jet people in tiny pods at over 750 mph. The train hopes to cut the trip down to two-and-a-half hours. Hyperloop aims for a mind-boggling one. The HSR delay could leave the runway wide open for Hyperloop. The fact that it’s entirely privately funded could get it out the door faster. The train is getting money from mixed sources: private funding, state taxes, and a $9 billion bond voters approved in 2008. The Los Angeles Times reports that the project still needs $25 billion, whose source right now is TBD. (In other words, for now, it’s the federal government.) But the Hyperloop? Citizens don’t need to worry about having their tax dollars thrown at the moonshot. The money’s coming from private sources. The Hyperloop is still largely conceptual—there are still competitions being held to determine what the tube and its pods will actually look like. But earlier this week at a transportation conference in LA, Hyperloop Technologies, one of the three companies working on a Hyperloop test track, said that the first track should be ready by the end of this year in Las Vegas. However, Hyperloop still needs to get the land rights—which HSR already has. Other challenges will remain, too, especially considering Hyperloop’s not designed to stop at the many cities in between San Francisco and Los Angeles. (That’s also the reason why many Texans are opposing their own bullet train, which might also travel nonstop between Dallas and Houston and screw everyone in in the middle.) However, there’s another, more practical use the Hyperloop could serve: It may be more suitable for goods, not humans, which may be a more convincing, practical argument for those naysayers. 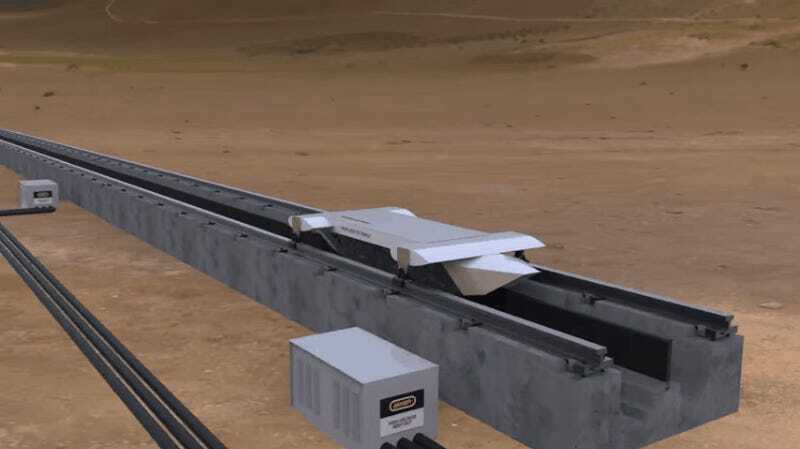 What’s nuts is that the Hyperloop obviously sounds more insane—it’s basically designed to shoot passengers like bank checks through a drive-thru pneumatic tube. But so far, plenty of big names have shown support for the idea, including Elon Musk, SpaceX, MIT and other universities from around the world, even US Secretary of Transportation Anthony Foxx. If enough power and cash can get behind it, the Hyperloop might be less sci-fi and more real-life sooner than we thought.